A COLLISION BOUNDARY OCCURS WHERE 2 CONTINENTAL PLATES are MOVING TOWARDS EACH OTHER. Because they are both continental crust, they have the same density, so when they collide neither one sinks. They smash against each other and build up immense pressure, that builds and builds and builds, until finally the plates buckle upwards creating a MOUNTAIN RANGE. Most of the world's largest mountain ranges (Himalayas, Alps) are next to collision boundaries. 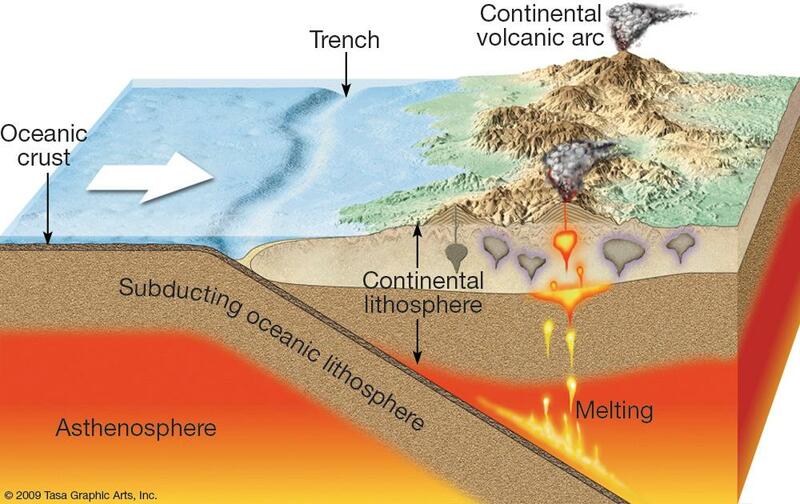 A SUBDUCTION BOUNDARY FORMS WHERE 1 CONTINENTAL AND 1 OCEANIC PLATE are MOVING TOWARDS EACH OTHER. 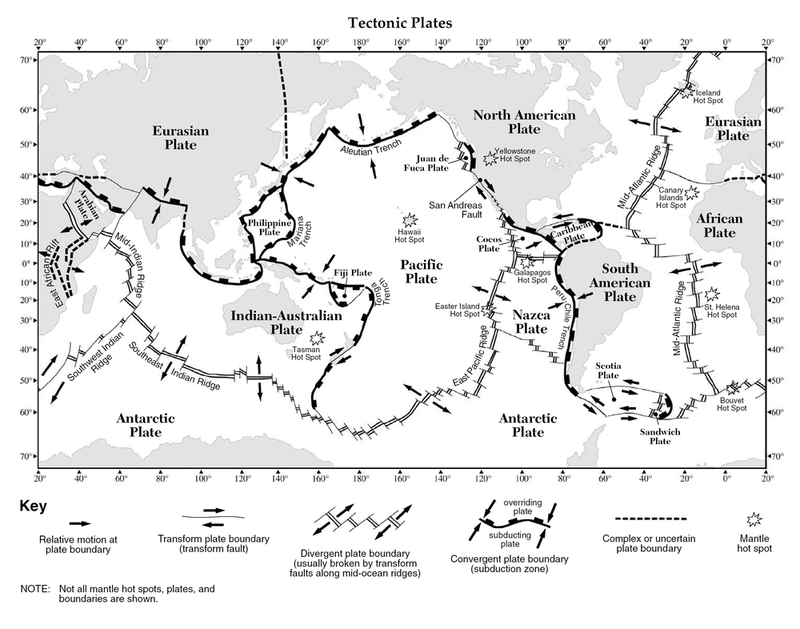 Because the oceanic plate is made from basalt and has a greater density THE OCEANIC CRUST ALWAYS SINKS UNDER THE CONTINENTAL CRUST. The sinking crust is forced down into the asthenosphere where it melts, becoming super hot magma. This new, hot magma rises quickly to the surface under the continental plate to create VOLCANOES. The sinking crust also creates a very deep area of the ocean right off the coast of the continent. These exceptionally deep areas are called TRENCHES. Subduction boundaries are also the main source of particularly deadly events called TSUNAMIS. A TSUNAMI IS A HUGE WAVE THAT TRAVELS AT GREAT SPEEDS ACROSS ENTIRE OCEANS. THEY ARE CAUSED BY UNDERWATER EARTHQUAKES THAT DISPLACE HUGE AMOUNTS OF WATER. Tsunami's present a several very serious threats to coastal areas. Because of their speed, there is very little warning before a tsunami strikes, which makes them particularly deadly. The force of the wave is enough to damage and destroy structures. The amount of water carried on to land causes severe flooding and presents the risk of drowning. As the wave retreats back into the ocean it pulls out debris and anything or anyone else in its path back out to sea. A DIVERGING BOUNDARY OCCURS WHERE ANY TWO PLATES are MOVING APART . Diverging boundaries are almost always found at the bottom of the ocean. When 2 plates separate, magma rushes up to fill in the gap. This magma quickly cools to form igneous rocks. The result is the creation of a MID-OCEAN RIDGE that runs along the boundary. To either side of the ridge are lower, flatter areas called RIFT VALLEYS. TRANSFORM BOUNDARIES OCCUR WHERE ANY TWO PLATES are SLIDING ALONGSIDE EACH OTHER. They are not moving toward or away, but rather sliding past each other. A famous transform boundary exists in California, where the Pacific Plate is sliding past the North American plate. In between the two sliding plates at a transform boundary is a FAULT , or crack in the crust between two plates. Page 5 of the ESRT shows us a world map with all of the tectonic plates and boundaries on it. Plate Names are shown in bold in the center of the plate. Type of Boundary Can be Determined Using the Key at the Bottom. BE CAREFUL!!!! THE ESRT DOES NOT DISTINGUISH BETWEEN SUBDUCTION AND COLLISION BOUNDARIES!!!! Let's Practice: What type of boundary separates the North American and Eurasian Plates? If we look at the ESRT we can see that N America and Eurasia are separated by a DIVERGING Boundary. Let's Practice: What type of boundary separates the Nazca Plate and South American Plates? 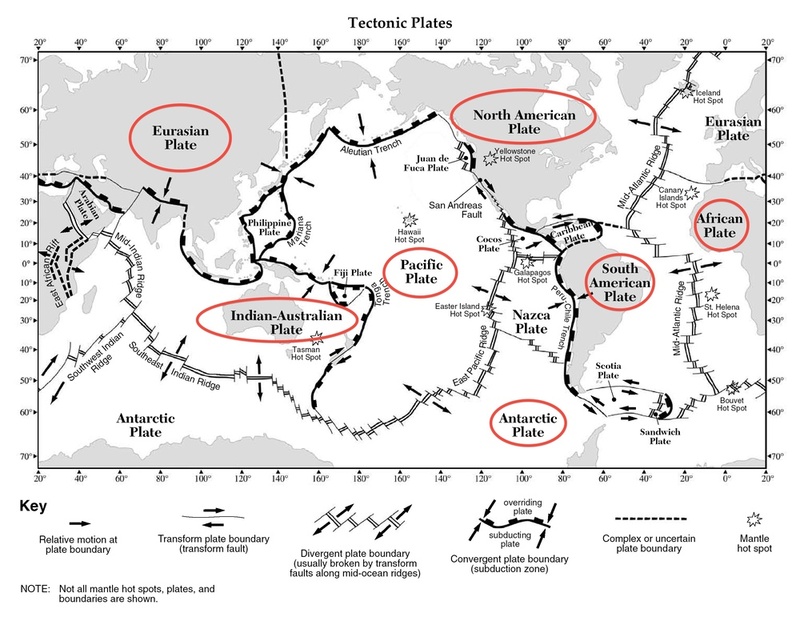 If we look at the ESRT we can se that the Nazca Plate is Oceanic crust, and S American Plate is Continental Crust. they are separated by a SUBDUCTION BOUNDARY.